Dugi Guides™ LTD | UltimateWoWGuide.com is a privately owned company based in Christchurch, New Zealand founded and created by Dave Farrell (Dugi) in 2005. 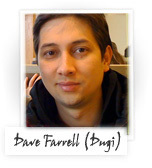 Dave Farrell is a 36 year old male, married and is a father of three young boys. Dave is an avid gamer since early childhood and is a huge fan of Blizzard games. The overwhelming success and response from the community sparked a demand to create a premium content where it was made available at ultimatewowguide.com. Today ultimatewowguide.com also known as Dugi Guides is focused on developing in-game guides for World of Warcraft with their own custom built AddOn.